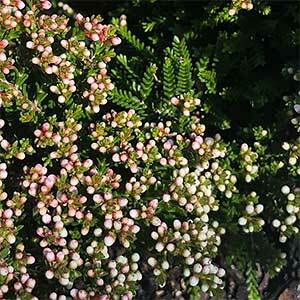 With flowers from winter through to spring, Micromyrtus ciliata is available in two forms, one a low growing or prostrate variety the other a small shrub. 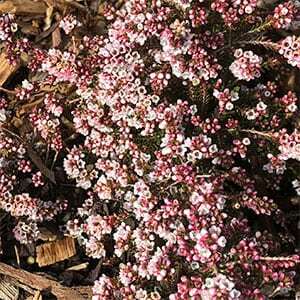 Very small leaves and a natural arching habit make this a most attractive plant for general garden use or the rock garden. Commonly called the Fringed Myrtle, over time it can form a large spreading shrub and when in full flower is a feel feature in the garden. The plant can be pruned by removing a whole spray that can be used for backing in a flower arrangement. Another attractive species with good foliage this is a plant that is not widely offered for sale. Additional water through the first summers will assist with establishment. Soil – Well drained and Lime free. Spread – To around 2 – 3 metres. Foliage – Small green and aromatic when brushed..